EverCare at Home, our Certified Home Health Agency (CHHA), brings quality support to you in the privacy and comfort of your own home. Whether managing an existing condition, recovering from an injury or illness, or working to restore self-sufficiency, our professionals consult closely with you to create an individualized care plan that meets your needs and addresses your wishes. EverCare at Home is both Medicare-certified and accredited by Community Health Accreditation Partner, Inc. (CHAP), the leading accrediting organization for the home health care industry. 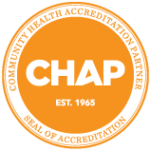 CHAP Accreditation demonstrates that EverCare at Home meets the industry’s highest nationally recognized standards.